Decorate your child's room with this SPORTS themed- stretched-canvas art set. This vintage style Baseball, Basketball, Football Art set will bring the love of sports into your Baby nursery, Boys Bed Room, Den, Bar, Game Room and Kids' room. Featuring Baseball, Basketball, Football Art in a vintage look, this wall art set will please any old or young sports fan. With its wraparound design, it's a true gallery art masterpiece from every angle. Great for Boys Gifts. Set of 3, 14" x 14" each. 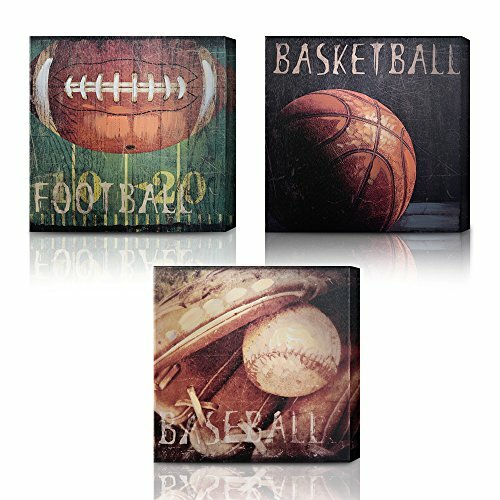 GREAT HOME DECOR PIECE: The 3 Piece Sports canvas wall art set is great for baby nurseries, kids rooms, girls room, baby room. If you have any questions about this product by Green Frog, contact us by completing and submitting the form below. If you are looking for a specif part number, please include it with your message.